15.09.2009: Complete rewrite of the script to tidy up the code, improve functionality, and to add jQuery-logic to make it run smoother. This script is used to Compare a “DueDate” in a list view with “Today” and generate “traffic lights” to flag status. It also adds a mouseover tooltip that shows the list element’s “day, hour and minute – status”. yOffsetMinutes = 2880; // When to show the yellow "flag"
rOffsetMinutes = 1440; // when to show the red "flag"
TooltipDays = ['day','s']; // Array - first value for "singular", second for "plural"
TooltipHours = ['hour','s']; // Array - first value for "singular", second for "plural"
TooltipMinutes = ['minute','s']; // Array - first value for "singular", second for "plural"
* All variables are defined in a CEWP below the list view of your list. See separate codeblock for code. 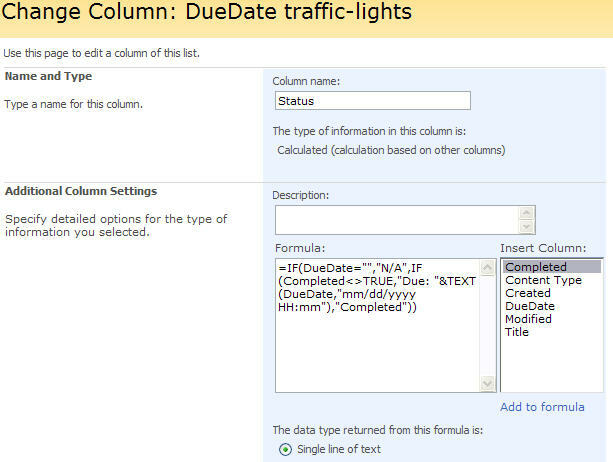 The DueDate-column does not have to be in the list view, but the calculated column must be. Hi, This is exactly what I am looking for to complete a minor project I am undertaking currently. I have a few questions as I am an administrator doing the job of a developer at the moment so as you can predict it will be boring stuff like how and where does this script go etc. Would you mind answering questions of this nature? This may work and if so then thank you, but, Lotus Notes had this functionality Out-Of-The-Box, 15 yrs ago. I cannot comprehende how Microsoft can claim they have an Enterprise Solution that does not provide this feature with nothing more than a few clicks for each view. Dispicable. Nothing new for Microsoft though – a company that should stick to games instead of destroying the world with dysfunctional technologies for business. Not at all – feel free to ask. I have been to busy to update this blog, but i have made a new version of this script. I will post it later today. Thank you – much appreciated. 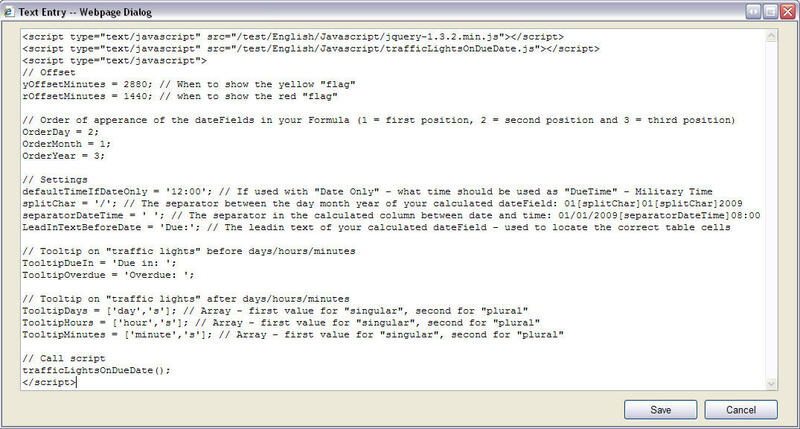 From what I have read here my understanding is that when creating the date column I am to use the formula as you have provided above – then in a content editor web part below the list I add the Jscript … is it then a case of hey presto? Do I need to call the column DueDate? No – only refer the “original” date-column in the formula in the calculated column you create. It should work with only the steps you describe, but remember to use a datatype of “Date and Time” in your calculated column. The “original” date-column you use as source for your calculated column does not have to be in the view at all. Great stuff thank you very much! This solution is very useful for me as my company has gone down the route of buying the standard edition of SharePoint and I can not use Data Views which are part of the enterprise edition! Madness if you ask me – just another victim of the Credit Crunch haha! Do you use english language SharePoint? -if not maybe the formula syntax is incorrect in your language? yep it is for a site in England … Though it might be down to the date format in the formula so that day comes first then month the n year but that didn’t do anything either. The status column how is that created? I`m guessing you simply create a custom column with status as the title?? I have read a round and made some ammendments to the formula according to what I have read – however there is still a bad syntax somewhere in there. Thank you for your support it is much appreciated. You have to manually rewrite the quotes – it is the wrong format when you cut and paste from this text. Alexander, how did you make so that the caption on the Status Filter Drop-Down was “Due: 11/23/2008”, as opposed to the HTML code that it actually has? TIA. Sorry for not replying – have been very busy at work this week… glad you figured it out! I’d like to combine 2 of these ideas but cannot find the internal column name for a workflowstatus column. ie I want to traffic light as you’ve got but add a second condition to the lights checking the status of the associated ‘Approval’ workflow. I can’t seem to get the type and fieldname of this column to compare. Sorry, but it’s not possible to use “workflow columns” in calculated column’s formula. i am using the Room and Equipment reservation template, where i have start date to be selected. what i need is how can i stop users from selected date less than todays date and time. I made it work easy. Now I need to do the same but with minutes instead of days. You see, we have a ticket system that handle requests that must be taken from queue in minutes, the minimun amout of time being 15 min. I tried to modify your code with no success. Can anyone give me a hand? I believe you can use the script to fill your need now that it’s updated. Drop me a line if you can use it – or if something is not as expected. How would you add a column that displays the day remaining from duedate to todays date? The default format is “days hours minutes”, but you can edit the function msToDHM() to return days only. Firstly, thank you for the great work – the soution is useful. Unfortunately the script does not work if your list view contains grouping by a column of Lookup type or by Assign To. In this case the data in your Status column is shown straight from Excel formula, not the coloured dots as expected. Could you please check? I did a quick test and it does work for me when grouped by a lookup column and on “Modified By”. Are you sure you have set it up correctly? – can you test by removing the grouping? Thanks for the help Alex – Any way to utilize this in a Gantt view highlighting the tasks bar? Sorry, but i have not tested it with Gantt view’s. I know Christophe over at Path to SharePoint has loads of tricks for Gantt view’s – check out his site and see if you find what you are looking for. I can’t get this to work. I’m thinking maybe I don’t understand the part “Add a CEWP to your list view – below the list form.” I have a list and I opened its “RssView.aspx” file in the SharePoint Designer, and added a Content Editor Web part in one of the available PlaceHolderUtilityContent areas at the bottom of the page. Is this OK? (I’m new to SharePoint, so I don’t really know what I’m doing). I don’t get the nice traffic lights and colors, just the “Due: 11/23/2010″ type text. The other thing I’m questioning is, is the AllItems.aspx file the correct file to be editing? You refer to the “list form”, but I’m not quite sure what that is. Double check that you have saved the script in the correct format (hover over the script and click “view source”, highlight and copy – paste in notepad and save). Both should give you a dialog box with “function”. If you get “undefined”, the scripts are not referred correctly. If you get “undefined” your path tot the file is incorrect, or the file is corrupt. Try pasting the “src” for the script in a new browser window address bar. If it is correct, you should get a download prompt (or the script should show in the browser window). OK never mind! I finally got it. I put in the full path to the scripts source and it worked!! I must have made an incorrect assumption about our site path, and so got the wrong relative path. Thanks so much for your help and for sharing your scripts. This is great – I had been using workflows to update a status field with icons based on due date. Instead of the bullets, I used the words Satisfactory, Warning, Critical, and Past Due. I use these same terms to do some SharePoint charting using Fusion Charts. Fusion Charts reads the value of the field by reading up the XML for the list. The issue I have is that the actual field value for the calculated column is “Due Date: mm/dd/yyyy” – what I need it to be is “satisfactory”, ‘warning”, etc. so that I can chart it. Is there anyway to populate an additional column with the text that is rendered in the calculated column? Also, do you accept any PayPal support for your efforts/time/web hosting fees? I’m afraid this is not possible using this approach. While you can swap the bullets with the text, the values only “live” in the browser window. No changes are written to the list and therefore you cannot chart using this values. Another note about this approach is the fact that it relies upon the users “locale computer time” to be correctly set. What is the script for the jquery-1.3.2.js? I would like to use this script on my sales site..I’m new to jquery and would like to use the traffic lights to signal if the sale goal is reached green – average yellow or below. How do I adjust the code to allow to a text field called score. I love this code! is there a way to replace the colored bullets with text? I need to be able to flag a task if today is more than 45 days past the assignment date. Instead of the red bullet, I’d like the field to state “Overdue”. First time poster, long time reader :-). I was wondering if this code could be modified to show the today’s date field. It seems a lot of code can show a comparison of a predetermined date to [today]. Is it possible to set up a jscript that will dynamically update to the local current time and date? To be more specific with the last post, add a column that show’s today’s date and time to the calculation. I’m not quite sure what you mean. You cannot use todays date in a calculated column because the column value is “static” and updates only when the item is modified. If this is not the answer to your question, please rephrase or send me some more information in an email. How hard would it be to change the code to change the background color of say the due date cell to yellow, red, green instead of adding bullets? I have 4 dates in each row that I need to color based on todays date. This code works good on my site. Thx for posting it. Instead displaying colors is it possible to display only Days information? Like If its Due In it should just display Due In: 8 Days (no hours and minute) and if its Overdue also it should just display the number of days. Thx again for posting this. Looking through the site if there is a script that I can incorporate with this one to hide the Status column. I can remove the DueDate column from the view to work but as you mentioned the Status column needs to be there. Is there a way to retain the color highlighting on the row but hide the status column? Also would this work on two seperate due date fields? just I want to ask you why you add Completed field (Yes/No) in the above list. as you know the built in task list come with Status field where you can define the status such as in-progress, on-hold, completed….etc. I followed your steps and everything works find. but i don’t want to add unnecessary field in my list. is there a way to just compare the due date with today and put the color accordingly. This is an example, you can use whatever formula you want. Where do you get this error? – when saving the file in the browser, or in SharePoint? I need to see the actual error message. This messages does not look like they are related to the traffic lights solution. Does the page where you want this solution activated use the default master pager? (if it is not created in SPD it does). Sorry for the late reply. Unfortunately there is not much I can do for you as the errors you posted is not related to any of the functions from this solution. Great idea how to work with today’s date. However it’s not working in my situation. I’ve a (dashboard) page with a document library web part. I’ve created the calculated column Status (named ‘Alert’ in my solution) and it properly displays “Due: “. But the script (placed in a CEWP on the same page) ain’t replacing this text by bullets, am i missing someting? Doesn’t work this solution on document libraries? Can you help me fix these errors? Hey Bertrik, did you manage to make it work? It looks like you might have a corrupted file. Can you try copying the code again? I’ll remove the function for grouped views, because those won’t be used on these pages. For some rows it’s correct, but others rows say it’s today (around) 18 Sep. 2015. How is that possible? Hard to tell. Ensure you have set the correct data format in the setup. I am getting some difficulty to implement your code on my SPS site. I followed all the steps and the only difference is the jquery version, which is the update version 2.1.4. The Status column is giving the “Due: MM/DD/YYYY” as expected, but the java code seems to not work. Hey, anyone can help me with my question above?? The code is created to run with jQuery and will not run without. You don’t need to use the old v1.3.2 version if this is the problem, but you need jQuery.